Running Press Adult, 9780762437986, 240pp. Summertime's here, and 'tis the season for making ice cream at home for parties, backyard barbecues, and beach getaways. A guide to more than two dozen of the nation's best artisan dairies, Scoop takes you on a colorful tour with photos, stories, and histories of these mom-and-pop shops. Author Ellen Brown has reinterpreted classic frozen recipes for the home cook, each fitted to the most popular ice cream freezers on the market. Explore the nation's favorite ice cream shops with a plethora of delectable photographs and 150 recipes--featuring ice cream, gelato, sorbet, and more. This is the must-have guide for the at-home ice cream connoisseur. Ellen Brown is a 30-year veteran foodie. She is the author of 23 cookbooks, including several Complete Idiot's guides. She is the founding food editor of USA Today. Her writing has appeared in numerous major publications, including The Washington Post, The Los Angeles Times, Bon Appétit, Art Culinaire, and The San Francisco Chronicle. She lives in Providence, Rhode Island. "Anyone can follow her recipes and make premium ice cream, gelato and even dairy-free sorbets. By mixing fresh fruit with sugar, milk and a few seasonings, you have your own small-batch homemade ice cream…. In fact, the book is rather current, with stories about great ice cream shops, old and new, across the country. In that way, it serves almost as a travel guide…. 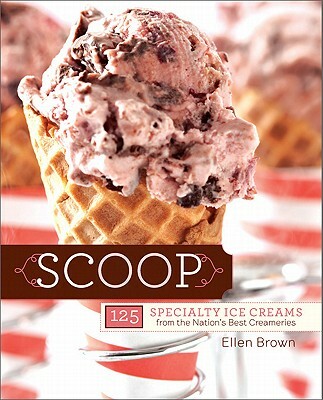 In fact, there is very little in the world of ice cream, gelato, sorbet and sherbet not discussed within the pages of Brown’s 240-page “Scoop,” and all of it will make you crave a cone or a cup." "I'll sit down for hours with any cookbook Ellen Brown writes--and there are a slew of them--so I pay attention when she turns her focus on what is, let's face it, the world's favorite food. Had this book only been a collection of Brown's recipes it would be well worth the modest price, but this is much more, for Brown has always been an astute culinary historian, and she lovingly describes the background and special qualities of wonderfully ice cream stores all over the USA, from Bassetts in Philadelphia and Herrell's in Northampton, MA (she rightly credits Steve Herrell for creating the artisanal ice cream movement) to Graeter's in Cincinnati and Sweet Republic in Scottsdale, AZ. The recipes are culled from these icons, and Brown makes sure they work for use in the home kitchen." "What makes Brown's book so great (is) making ice cream isn't difficult, it simply requires more focused attention than we think to make that revelatory every night scoop. Brown's recipes (Campari grapefruit sorbet, cashew caramel swirl ice cream) aren't exactly complicated, they're more the highly focused types. What's interesting here is that Brown lassoed in and adapted recipes from some pretty stellar ice cream shops around the country, along with plenty of just plain old "good" affairs -- the sort of rare balance that makes us want to actually make that chocolate Cabernet ice cream (Moomers in Michigan) and its black licorice ice cream cousin from Wisconsin's Door County Ice Cream Factory." "Ellen has a highly developed palate, the ability to recreate the dishes she samples, and razor-sharp writing skills. She brings all of these skills, plus her encyclopedic knowledge of the chemistry of cooking, to “SCOOP,” a collection of recipes for ice cream, gelato, sherbet, and sorbet from the best artisanal purveyors of frozen delights across the country… If you only have room for one ice cream cookbook on your shelf, this is the one." "Brown breaks the myriad of fanciful flavors into clear-cut, reader-friendly chapters: for instance, classic vanilla, chocolate and coffee are allotted their own sections, as are fruits, nuts and seeds and even liquor-infused ice cream. Furthermore, among the many ice cream selections you'll find creative standouts like the Grapefruit Campari Sorbet, the Mojito Ice, the Fig Gelato, the Chocolate Peanut Butter, the Sesame Brittle Cinnamon and the Apple Pie Ice Cream. There are also instructions for homemade hot-fudge, marshmallow and butterscotch sauces."